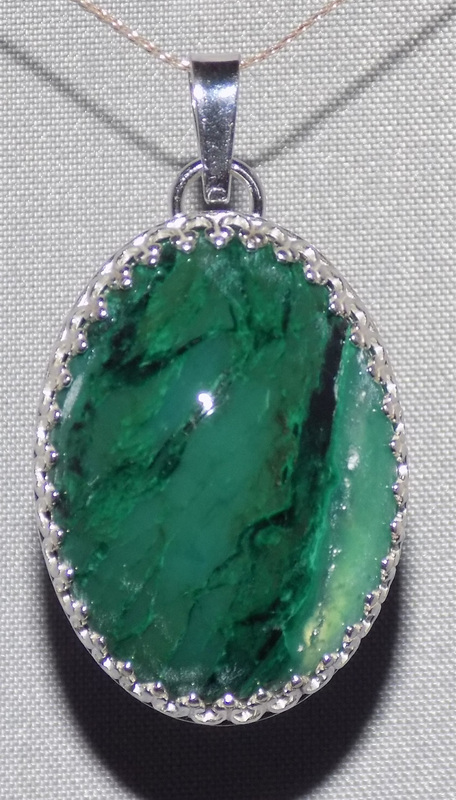 This simple Chrysocolla oval is wrapped in a Sterling Silver bezel. Chrysocolla is an interestingly colored mineral. Its can have some of the brightest shades of blue and green. These shades are caused by its copper content. Chrysocolla often has a layer of drusy, or glossy clear quartz, thus making each one unique. This beautiful Chrysocolla and Sterling Silver pendant is approximately 1 3/8″ tall, including bail, and 3/4″ wide. The necklace includes an 18″ Sterling Silver Chain.